3.9.1 The 2nd PRC had recommended 5 sets of scales for five categories of CPSEs (namely A+, A, B, C and D) which were devised by the 2nd PRC. However, this new categorization of CPSEs and different sets of payscales recommended by 2nd PRC were not agreed to by the Government. a. The 7th CPC has dispensed with the system of Pay Bands and Grade Pay, which was introduced by 6th CPC, and brought in a new model in the form of Pay matrix with distinct pay levels by subsuming all the existing levels in the new structure. There shall be now 18 levels for Central Government employees (inclusive of staff and officers). 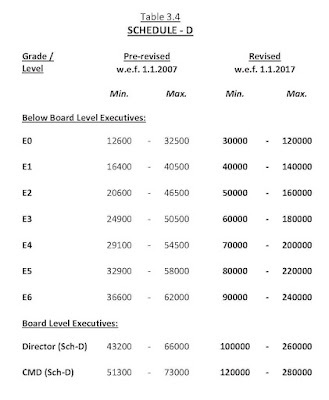 Under the new Pay-matrix, it has been ensured that neither any new level is introduced nor any existing level has been dispensed with.
. “Horizontal range” in which each level corresponds to a ‘functional role in the hierarchy’ and has been assigned the numbers 1, 2, and 3 and so on till 18.
. “Vertical range” for each level denoting ‘pay progression’ within that level. These indicate the steps of annual financial progression of 3% within each level. A Central Government employee at a particular level progresses within the level as per the vertical range. The movement is usually based on annual increments till the time of their next promotion. As and when an employee receives a promotion, he/she will progress one level ahead on the horizontal range. 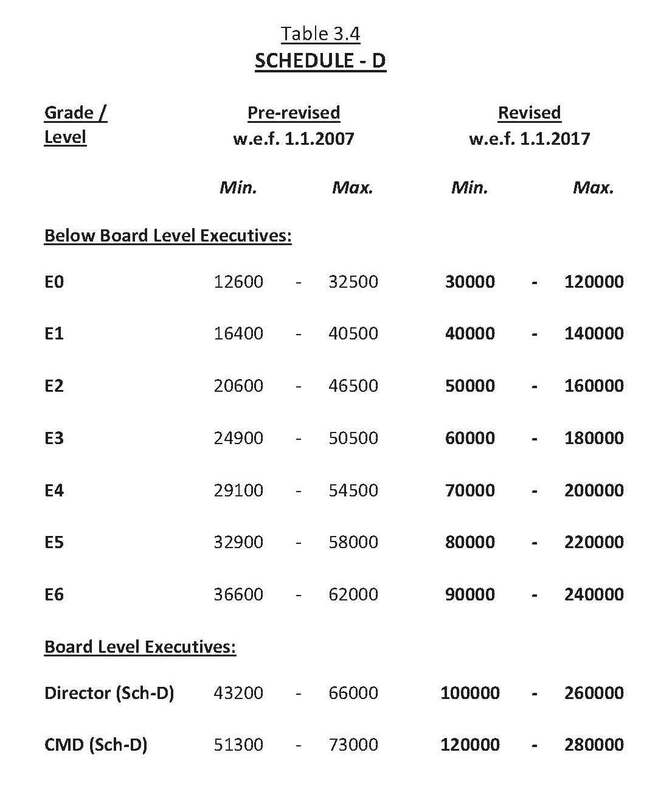 c. In the report of 7th CPC, the minimum pay of the revised Pay-matrix has been computed by applying the index / factor ranging from 2.57 to 2.81 over the pre-revised minimum of Pay band and Grade pay. d. Further, in the report of 7th CPC, while detailing on the fundamentals of pay-progression behind the Pay-matrix, it has been mentioned that in the true spirit of having open ended pay scales the span of certain levels has been kept at 40 years to ensure that no stagnation takes place. The 7th CPC has particularly mentioned that it is important to note that the end-points of any column do not signify the end points of any traditional pay scale. 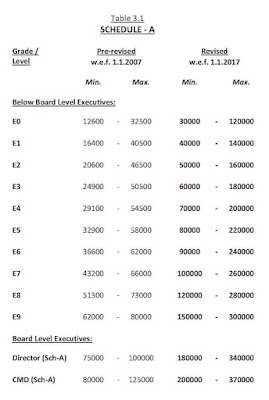 Hence, it is stated that in any kind of calculation which attempts to work with the “maximum pay of a particular pay scale”, it would be inappropriate, even incorrect, to pick the last figure of the column to be so. The column spans have been kept at 40 to cater to persons who may enter a particular level at any stage and may have resided in the level for a fair length of time. 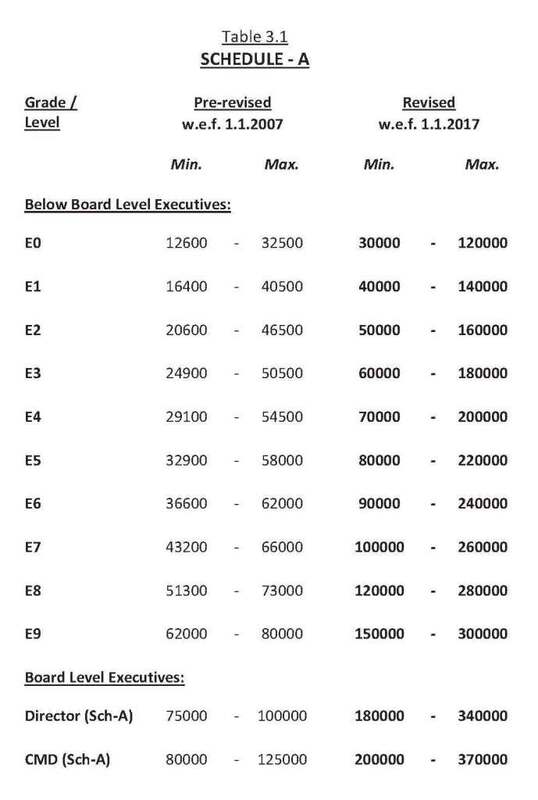 The end-points of the column, representing the possible highest and lowest pay in that level, may not be treated as the maximum and minimum of any closed pay scale, as used to prevail prior to the implementation of the 6th CPC. 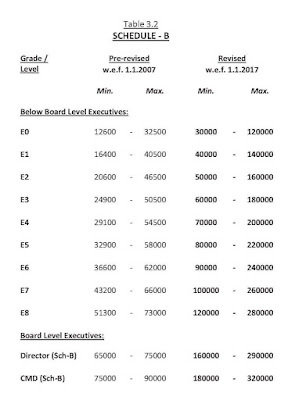 e. The pay matrix recommended by 7th CPC ensures that an employee who does not have any promotional prospects in his cadre will be able to traverse through at least three (horizontal) levels solely by means of assured financial progression along the career ladder of any employee, assuming a career span of 30 years or more. However, the 7th CPC has also indicated that annual Increments of non-performers should be withheld after 20 Years, and thus the employees should be able to meet the benchmark within the 20 years of service, which will be in the nature of “efficiency bar”. f. For Central Government employees, the problem of stagnation was resolved by previous Pay Commission (i.e. 6th CPC) by way of introducing running pay bands that provided for a sufficiently long span in a manner that no employee ordinarily stagnates at any stage in his/her career. Further, to ensure that no stagnation takes place, it was also allowed that Government employees stagnating at the maximum of any pay band for more than one year continuously shall be placed in the immediate next higher pay band without any change in the grade pay. g. Though the stagnation issues were resolved for Central Government employees in the last pay-revision itself with the recommendation of 6th CPC, and it is also ensured under the 7th CPC that no stagnation takes place, however in respect of CPSEs executives the problem of stagnation remains and they are currently allowed a maximum of three stagnation increments, one after every two years, provided the executive gets a performance rating of “Good” or above. i. For CPSEs, there are 10 model pay-scales specified by DPE for below Board level executives out of which the permissible number of payscales allowed to CPSEs depends on its Schedule classification. The Committee recommends to continue with the same levels & numbers of pay-scales linked to the Schedule classification of the CPSEs without any change. ii. Though the CPSEs shall be operating the pay-scales model with starting point and end point, the Committee holds the view that the revised pay-scales should be formulated in the manner that executives in its normal career span should not suffer on account of stagnation. The span of pay-scales should thus accordingly reflect the fairness in grant of increments across stages in all levels / grades. iii. Further, the Committee is of the view that the minimum pay of the new pay-scale need not start at the value arrived after accounting for the full fitment benefit for all grades, as the fitment benefit is primarily for those who move on the date of pay-revision from prerevised to the revised pay scale. 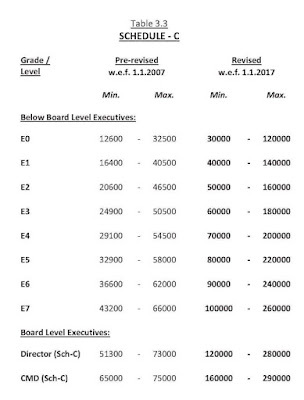 The minimum of revised pay-scales has accordingly been moderated for the grades. iv. Pay-scales have been formulated with reasonability and due consideration of existing pay-scales, full DA neutralization, recommended fitment benefit, span of pay-scales, flow of pay-scales across levels & across CPSEs schedules, etc. 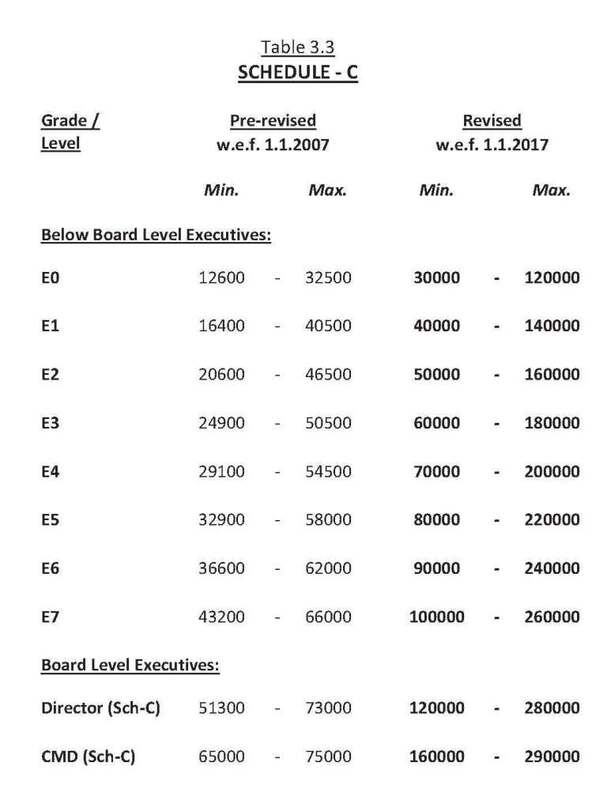 v. In accordance to above, the Committee recommends the revised pay-scales for the Board-level and Below Board level executives for each of the schedule of the CPSE i.e. Schedule-A, Schedule-B, Schedule-C & Schedule-D, effective from 1.1.2017, as placed at the Table 3.1, Table 3.2, Table 3.3 & Table 3.4 respectively.